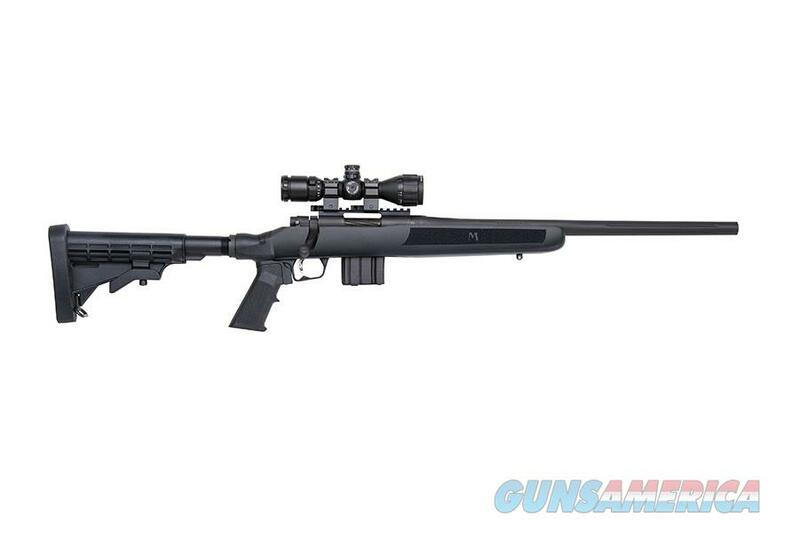 The MVP FLEX is a bolt action centerfire rifle. Features include spiral bolt fluted barrel, picatinny rail and the "LBA" (adjustable) trigger. It also comes with weaver-style bases featuring the "TLS" tool-less locking system. It has a 6-position tactical FLEX series stock. This combo comes with a 3-9x32mm lighted reticle scope. FEATURES: FLEX system offers tool-less take-down, compatible with other FLEX accessory buttstocks. Accepts AR style magazines, user-adjustable LBA trigger and pillar-bedded stock for superior accuracy, Picatinny top rail. FLEX stocks with the patented TLS Tool-less Locking System connectors allow removal and remounting of stocks in seconds. As part of a true multi-platform system, MVP FLEX rifles are compatitble with all FLEX accessory stocks in a variety of styles, finishes, and LOPs and can be used interchangeably with FLEX shotguns.